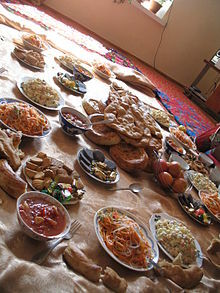 A Kyrgyz dastorqon being prepared for an afternoon meal (of paloo (pilaf), not pictured) during Nooruz. A dastarkhan (Kazakh: дастарқан, translit. dastarqan, pronounced [dɑstɑɾˈqɑn]; Uzbek: dasturxon, pronounced [dasturˈxɒn]; Dari: dastarkhawan‎; Hindi: दस्तरख़्वान, Urdu: دسترخوان‎; Pashto: دسترخوان‎; Tajik: дасторхон, translit. dastarkhān; Azerbaijani: dəstərxan; Kyrgyz: дасторкон, translit. dastorqon, pronounced [dɑstorˈqon]) is the name used across Central Asia and by Muslims of the Indian subcontinent to refer to the traditional space where food is eaten. The term may refer to the tablecloth which is spread on the ground, floor, or table and is used as a sanitary surface for food, but it is also used more broadly to refer to the entire meal setting. It is part of traditional Central Asian cuisine. The Mughal Indian book Dastarkhwan-e-Awadh, which details the Awadhi cuisine of Lucknow, emphasized the importance of the dastarkhwan. The word Dastarkhan is a Turkic word meaning "tablecloth" or "great spread". ^ Everaert, Christine (2010). Tracing the Boundaries Between Hindi and Urdu: Lost and Added in Translation Between 20th Century Short Stories. Brill Publishers. p. 75. ISBN 9789004177314.